Today was the last day of school for the semester. And, I ended on a high note. My College English class finished with a unit on food. We watched Food, Inc. (if you haven't seen it yet, go rent it NOW) and wrote response essays, arguing one of the questions the film presents. Before the movie, I asked students to briefly research one of the topics mentioned in the film (things like Monsanto, processed food, E. Coli, etc.) and present their findings to the class. They had a bit of difficulty understanding what processed foods were, so the next day I brought in a bunch of food packages. We discussed whether or not they considered each item "healthy," then we looked at the ingredients in each. We also talked about foods they typically eat, what they're made of, and how good they are (or are not) for you. We had our HuLuBu (Humanities Lunch Bunch) holiday party today. Everyone brought food and an ornament for our gift exchange. I tried to find the gaudiest, tackiest ornament I could. Of course, I had quite a selection to choose from at Target. At first, I was going to get this huge lime green ball with hot pink glitter. I finally chose an owl made from nuts. (Ironically, someone else chose that same one to give away!) But, since there were so many tacky ornaments to choose from, I ended up buying one for each person...specifically chosen to match their personality. When I was teaching in Highland, the teachers on my team would get together once a month or so to socialize outside of school. We'd take turns hosting, and everyone would bring something to eat. Susie, the other English teacher on my team, was notorious for her sweet teeth. The huge bag of chocolate chips (we're talking bulk-sized) that she kept in her freezer to snack on was often a topic of conversation. Surprisingly, she remains one of the thinnest people I know! Use your favorite brownie recipe (or boxed brownies). Use a 9x13 pan, or if you want thicker brownies use an 8x8 pan. With a stand mixer (paddle attachment), cream the butter & sugars together until well-blended. Add the extract & milk, blend until incorporated. Slowly add in the flour & stir until combined. Spread on top of the cooled brownies. Melt the chocolate with the butter in a double-boiler (or in the microwave). Pour over the cookie dough. Let cool to set before serving. Menu for Hope starts today! Be sure to browse the list of items up for raffle...including special meals, getaways, signed cookbooks, chocolates & homemade foods, kitchen tools, wine, artwork, and MORE! I was recently accused of being a Francophile. Ok, I'll admit to being slightly obsessed with French culture. Sure, I long to travel to Paris, to eat cheeses & baguettes in an outdoor cafe while sipping champagne. Is that so wrong? My accuser is Italian, so I can understand how he'd object to my "distinctly Francophilic leanings." Little does he know, I cook pasta more than anything at home. 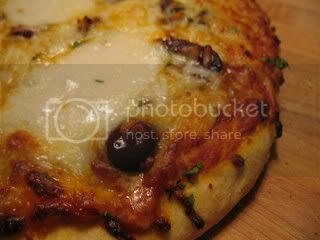 In fact, I've posted way more authentic Italian recipes than French ones...like carbonara, risotto, bolognese, ravioli, minestrone, and panzanella. Last night, I tried a pasta recipe from Gourmet Today. I received a copy of this massive new cookbook at a luncheon with Ruth Reichl, editor-in-chief of the recently defunct Gourmet magazine. 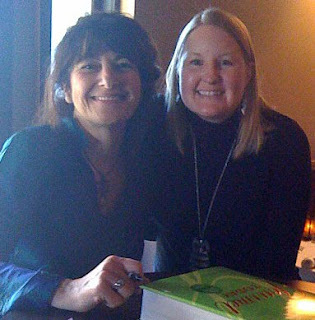 She came to St. Louis to promote the book, a visit that was originally postponed because of Gourmet's sudden demise. Before we ate, Ruth declared that Gourmet Today may be the "last cookbook of its kind." She explained that the twelve chefs in the magazine's testing kitchens would make a recipe five or six times before perfecting it. Even the simpliest recipes--which she says are the most difficult to perfect--were tested numerous times. She specificially mentioned the spaghetti with pecorino Romano & black pepper recipe with its list of only three ingredients. According to the cookbook, cacio e pepe is a classic Roman dish that "is so sublimely simple that initially we wondered if you would even need a recipe to make it. As it turns out, perfecting it was challenging, but ultimately we found the ideal combination of spaghetti, melting pecorino Romano, and crushed black pepper." For this recipe, you need to grate the cheese with the ragged-edged holes of a box grater for ease of melting. Don't use the small teardrop-shaped holes or a rasp (Microplane), as your cheese will clump up in the bowl. Toast peppercorns in a dry small skillet over moderately high heat, swirling skillet, until fragrant and peppercorns begin to jump, 2 to 3 minutes. Coarsely crush peppercorns with a mortar and pestle or wrap in a kitchen towel and press on peppercorns with bottom of a heavy skillet. Cook spaghetti in a large pot of boiling, salted water until al dente. Meanwhile, fill a large glass or ceramic bowl with some hot water to warm bowl. Just before spaghetti is finished cooking, drain bowl but do not dry. Reserve 1/2 cup pasta cooking water, then drain pasta quickly in a colander (do not shake off excess water) and add to warm pasta bowl. Sprinkle 3/4 cup cheese and 3 tablespoons cooking water evenly over spaghetti and toss quickly. If pasta seems dry, toss with some additional cooking water. Divide pasta among 4 plates, then sprinkle with pepper and 2 tablespoons cheese. Serve immediately with additional cheese on the side. My family used to cut down a fresh tree every year for Christmas. We'd pick one out at the tree farm near my grandparents' house the day after Thanksgiving. A couple weeks later, we'd traipse back out to the tree farm with a saw to cut it down. The holidays weren't complete without the whole family fighting over the tree decorating. 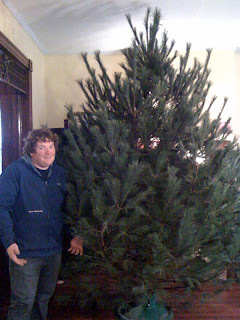 The first problem was that my mom insisted on a HUGE tree, one that was over 15 feet tall, since our living room had a towering cathedral ceiling. Of course, trees always look smaller out in the field. Inside, however, they barely fit. My dad would struggle with getting the tree home in our pea green station wagon (think Christmas Vacation). Once, the tree flew off the top of the car on the highway. My dad ended up laying in the wayback with the tree, holding on to it so it wouldn't fly out of the car. Then, he'd struggle with getting the tree inside. We always had to bring it in the back sliding glass door. We usually had to tie it up so it would stay straight. One year, he busted the ceiling fan with the ladder. Eventually, we'd begin decorating with multi-colored lights (the kind with the big bulbs), bubble lights, family ornaments, silver tinsel (strand by strand, as mom insisted), and candy canes. Even though there was always drama, I miss that time so much. My dad hasn't put up a tree since my mom died almost 14 years ago. Unfortunately, my ex-husband wasn't too keen on getting real trees. He (and his family) always put up a pre-lit, artificial tree. It made me sad. Luckily, Jerad's family always got a real tree...one they even cut down themselves! A couple years ago, I was supposed to go out to the tree farm with Jerad and his mom. It was a cold, rainy day--and I wasn't feeling well--so I told them I'd just meet at Jerad's parents' house to help decorate later that day. 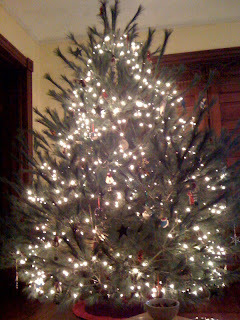 About an hour later, they showed up at my house with a gorgeous 12-foot Douglas Fir, lights, and ornaments. I can't really explain how much that meant to me. It made me realize that I'd found my "home." 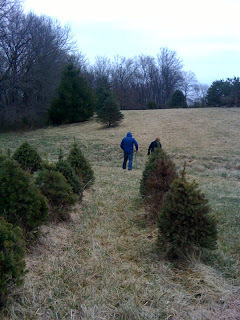 Today, after searching around two different fields, we cut down the biggest Christmas tree I've ever seen! Seriously, it takes up almost the entire room. It's crazy big! I'm still waiting for a squirrel to jump out. Of course, every tree trimming party needs a cocktail. This is the one I made tonight, after we'd finished decorating and were enjoying the lights & strong fragrance of pine. In a stand mixer, beat the egg yolks and sugar together with a pinch of salt until pale yellow and fluffy. Continue whipping and, very slowly, pour in the bourbon. In a separate bowl, whip the egg whites until they hold peaks. In a separate bowl, whip the cream until it holds peaks. Fold together the egg yolks, egg whites, and whipped cream. Garnish with lots of freshly-grated nutmeg. Note: This will keep for a week in the refrigerator. 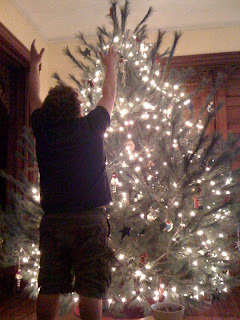 Jerad worshipping at the altar of The Tree. He's a little like Clark Griswold. I'm really trying to like the holidays more each year. What helps is all the rich, fattening, & sugar-laden foods that are perfectly acceptable to gorge yourself on during the month of December. Food traditions also help me to love the holiday season. For a few years, I made real Fettuccine Alfredo (heavy cream, butter, garlic, & Parmesan cheese) with crab on Christmas Eve. It's the ultimate in indulgence. Last year, we made Homemade Ravioli & Meat Sauce at Jerad's parents' house on Christmas Eve. We plan to make that our new family tradition. My favorite Christmas morning brunch dish is Salmon-Stuffed Puff Pastry, a roll of puff pastry filled with smoked salmon & herbed scrambled eggs. It goes perfectly with a mimosa (or two). Espresso Walnut Cake makes a tasty breakfast treat as well. I also make a lot of gingerbread during the holidays. My two favorite recipes are Chocolate Gingerbread and Triple Ginger Bread. Speaking of gingerbread, a couple years ago I was obsessed with gingerbread syrup (the kind of syrup they use in lattes). I got two huge bottles to make "Christmas in a glass" cocktails (champagne with a splash of spicy gingerbread syrup. I had so much of it, though, that I started coming up with different ways to use it, including a Gingerbread Vinaigrette which is delicious on a spinach & fruit salad with goat cheese. What holiday food traditions do you have in your family? Ok, so, this is day 9 of NaBloPoMo. I've been pretty proud of myself for posting every day so far, without much fluffy filler. While I have a lot of recipes waiting in the wings to get posted, I am running out of witty banter. Instead of telling an enlightening story, let me catch you up on what's been going on around here. First of all, I can't seem to figure out why the bold feature won't undo itself on the text in this post (or why some of the text is bigger than the rest). I've tried selecting all the text and pushing the "b" button & resizing the text, but it doesn't work. So, this post is in bold. With some bigger letters. Deal with it. For those of you who've been asking, there are NO wedding plans yet. We've talked about a couple possibilities, and even though I want to do something simple, we are running into a few snags (mainly WHEN to get married). I thought I had the perfect plan: Spring break, Vegas ceremony early in the week, pig roast reception later in the week. But that's probably a little too soon for our budget and a Vegas wedding/outdoor reception in the summer doesn't seem like such a good idea. So, we're still working on it. There is just over a week of school left before winter break. I still have a ton of papers to grade between now and then, but I've really been trying to not bring so much work home this year. All in all, I've had a fairly good year and am excited about some of the things going on in my classroom. I STILL haven't done any holiday decorating or shopping. I doubt we'll get a tree this year, since Jerad isn't done refinishing the floors yet. I suggested we not buy gifts for each other, since he just bought a ring and we should start saving for the wedding, but I don't think he's going to stick to that. So, I'll be shopping for gifts at the last minute like I always do. Today, I simply don't have a story to tell about quinoa or making this recipe...other than that the way I got Jerad to eat it for dinner was to remind him that there was BACON in it & that the quinoa was toasted IN BACON FAT. Oh, and, I've made quinoa before. If you're not sure what quinoa is, or even how to pronounce it, read that post. According to Serious Eats: "Full of fiber and antioxidants, this is one-bowl meal you can feel virtuous about eating. The bacon contributes smoky flavor and a nice textural contrast, but you could leave it out if you wanted to make this a vegetarian dish. (In that case, skip the bacon step and instead sauté the onions in 1 tablespoon of olive oil.)" My notes: First of all, when a recipe calls for 2-4 slices of bacon, I'm going to go with 4...because when it comes to bacon, more is always better. Right? Right. This, however, meant that I had too much bacon fat left in the pan. So, I drained some out until there was just a thin layer left in which to toast the quinoa. In a medium saucepan cook the bacon over medium heat until the bacon is crisp and the fat is rendered, about 10 minutes. Reserve the bacon bits. Saute the onions into the hot bacon fat, stirring occasionally, until the onions soften, about 5 minutes. Add the quinoa and toss until coated with the fat and the grains are slightly toasted, about 2 minutes more. Add the water and 1/2 teaspoon of the salt, bring to a boil, stir once, cover, reduce to low and let cook undisturbed until the water is absorbed and the quinoa is tender, about 15 minutes. While the quinoa is cooking, toss the sweet potatoes with the olive oil and salt and cook in a medium skillet until the potatoes are tender, about 15 minutes. When the quinoa is cooked, stir in the spinach & cook until the spinach is wilted. Add the sweet potatoes and reserved bacon. Hey, lookie here! I finally made another Tuesdays with Dorie recipe (I had to take a break, because there were simply way too many sweets around here all the time)! This week's recipe was chosen by Barbara of Bungalow Barbara. Sablés are delicate French shortbread cookies made with butter, sugar, egg yolks & flour. The dough, which is very crumbly, is shaped into logs & chilled before being cut & baked. Dorie suggests brushing the logs with egg yolk & rolling them in decorating sugar before cutting, to create a colorful edge on each cookie. 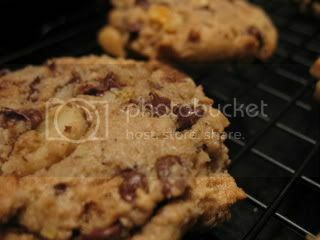 Instead, I cut the logs first (no egg wash) then gently pressed coarse sugar into the top of each cookie. I decorated some with peppermint-flavored red & white sprinkles and others with black & opal sugars. Since I am still getting used to my new oven, which is actually registering hotter than it should, I slightly burned the first batch of cookies. The rest, luckily, turned out great! Speaking of comfort foods...the ultimate comforting meal for me--and I'd guess for most people--is usually tomato soup & grilled cheese, old school style. It reminds me of childhood winters, of coming inside for lunch all pink-cheeked after playing in the snow; of grade-school cafeteria lunches, of being excited about getting to buy a lunch instead of packing one or walking home for lunch; of dorm-room meals cooked in a microwave and electric sandwich maker. It reminds me of my mom. I still crave the comfort of tomato soup and grilled cheese, but these days I forgo the canned soup & white bread with American cheese slices for a more "mature" version. Heat the oil in a large saucepan over medium heat. Add the onion & garlic and cook until soft, about 4-5 minutes. Stir in the crushed tomatoes and cook, stirring often, for 5 minutes. Add the stock, curry powder, and paprika. Simmer for 7-10 minutes. Puree the soup in a blender in three batches (be careful when blending hot liquids, as they expand). Pour each batch of puree through a strainer into a saucepan. Stir in the cream. Taste and add salt & pepper as needed. Serve with a sprinkling of chopped parsley & a few cheesy croutons (recipe below). For the croutons: Simply cut 1/2-inch thick slices of a baguette or a good loaf of bread. Toast the bread on both sides in a skillet with a bit of olive oil. Top each slice with a generous sprinkling of freshly grated cheddar & Parmesan cheeses. Broil the slices just until the cheese melts. Cut into cubes & add to your soup. Today is National Comfort Food Day, and I'm ready to celebrate. "Comfort" foods are my favorite foods to eat; I never tired of warming soups, hearty pastas, and rich desserts (which probably explains why I've gone up a couple pants sizes in the past few years!). I've eaten this spinach dish two times in the past four days. It's THAT good. Jerad's mom makes this recipe every year for Thanksgiving. It comes from her great-grandmother on her mother's side, Tuffy Lilian Iztwig (whose parents were German immigrants). The first time I spent Thanksgiving at Jerad's parents' house, his mom became too ill to finish cooking dinner. So, his sister asked me to make the spinach; there was no written recipe, and I'd never eaten--or even seen--the dish before. I was informed that it had "spinach and bouillon" in it. That sounded easy enough. I dissolved a couple bouillon cubes in about a cup of hot water, then I cooked the frozen spinach in it. I was later informed that my spinach wasn't right; it tasted nothing like it should. Last Saturday, I actually got to watch Gwen make the spinach. Wow, was it good! I ate the leftovers for breakfast with a poached egg on top. WOW, so good! I also made the spinach Tuesday night with our dinner of seared sirloin and cauliflower gratin. Our friend Ashby said the spinach was his favorite part. Add the bouillon cubes & mix to dissolve. 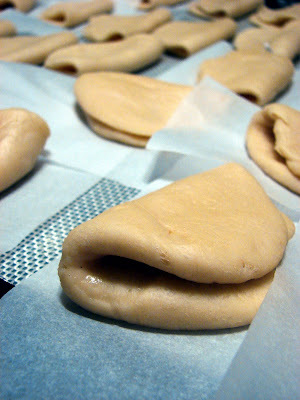 Stir in the flour to create a thin roux. Add the spinach, stir & cook until the sauce coats the spinach and it's all warmed through. I am thinking of offering a prize for this year's Menu for Hope campaign (see below for more info) & I need ideas! In the past, prizes were anything from home-baked cookies to signed cookbooks to dinner at local restaurants to trips to wine country. According to the campaign's creator: "The prize you offer need not be of high monetary value, but it should appeal to your readership. A small rule of thumb we'd like to suggest is that each prize offered should have the potential to raise at least $200. That means, don't offer a prize unless you are pretty sure you could get at least twenty of your readers to donate $10 for a raffle ticket toward that prize." I've thought of offering a private cooking lesson or a catered dinner, but I'm not sure I'm comfortable with going to stranger's house for that (unless, of course, one of my friends were to win!). ANY SUGGESTIONS? WHAT KIND OF PRIZES WOULD YOU LIKE TO BID ON? I am hoping one of my favorite local chefs/restaurants/businesses (you know who you are!) would be interested in donating something that I could offer through my blog (I'll handle all the hosting details & contact the winner with information on how to claim their prize). I'm thinking....dinner for two at one of St. Louis's best restaurants? A private cooking class at one of the city's best cooking schools? PLEASE CONTACT ME IF YOU ARE INTERESTED IN DONATING SOMETHING! I'd really like to see St. Louis get involved in this worthwhile endeavor. What is Menu for Hope? 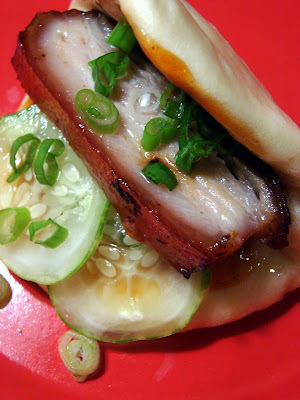 Menu for Hope is an annual fundraising campaign hosted by me and a revolving group of food bloggers around the world. Five years ago, the devastating tsunami in Southeast Asia inspired me to find a way to help, and the very first Menu for Hope was born. The campaign has since become a yearly affair. For the past three years, Menu for Hope raised nearly a quarter of million dollars in support of the good work of the UN World Food Programme, helping to feed hungry people worldwide. So, I’ve decided to participate in National Blog Posting Month (NaBloPoMo) , an event that challenges bloggers to post every day for a month. I’m attempting this for a few reasons. First, I get a couple of weeks off this month for winter break, so I’ll have more time to do some cooking and writing...and there are so many things I've been wanting to cook! Secondly, December is a great food month. I plan to post several of my favorite holiday and winter recipes as well as some ideas for food gifts. Finally, I kind of hate this month. Christmas is usually a stressful and emotional time for me. (Though, the longer I am with Jerad, the more I like it.) Nonetheless, daily posting will help to distract me from my normal bah-hum-bug-ness. Hopefully, anyway. Since the weather has finally gotten cold (I actually had to scrape ice off of my car windows this morning), Jerad had a good duck hunt today (he says the best in two years). Instead of just cutting out the breast meat, he also harvested (harvested? that seems like the wrong word) the livers and cut off the legs (we are going to try making confit sometime soon). Tonight, Jerad sauteed the livers--that were soaked in milk then seasoned simply with salt & pepper--in a little olive oil. He served them with baguette slices and rendered duck fat (that we schmeared on the bread like butter). I was skeptical, thinking the wild duck livers would be too gamey, too--well--livery. But, there were delicious!